Check Out A New Grindhouse-Afronerd Radio Podcast LIVE Tonight at 6pm Eastern! 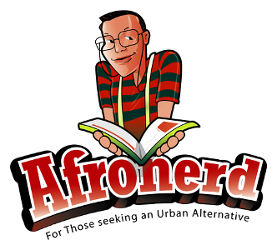 Discussing Random Acts of Flyness Ep1 BELOW - Afronerd: The Blerd Revolution Has Begun! It's the Grindhouse, citizens! Our latest installment streams LIVE every Sunday at 6pm eastern as engineered by the Afronerd Radio machine. Join your favorite podcasting crew as they wax about the following topics: director/musician, Terence Nance's Random Acts of Flyness (HBO) premiered this weekend and it appears to be picking up where Sorry to Bother You left off; And speaking of STBY, the film's director is asserting that international distributors are passing on global showings because of the "Black films don't sell overseas" mantra; Chicago has its first First Wakandacon which is not only an ode to the Black Panther mythos but also Afro-futurism; EA Sports apologizes and promises an update to address the suspicious omission of Colin Kaepernick's name from their Madden NFL '19 soundtrack (spec. the YG song, "Big Bank"); FX CEO place blame squarely with Marvel for cancelling The Glover Brothers version of the highly anticipated Deadpool animated TV series; a new CBR (Comic Book Resources) article highlights some of the most iconic Marvel arcs that can now be explored post the finalization of the Disney-Fox merger; Luke Cage season 3 has not been confirmed by Netflix but is it simply that the writers are trying to come up with something compelling or is a Heroes for Hire iteration in the works featuring Danny Rand? ; actor, Sir Patrick Stewart reprises his role as Capt. Jean-Luc Picard for a new CBS All Access Star Trek streaming series; Venture Bros S7 returns (finally) on Adult Swim; And lastly, Dburt may be warming up to Sony's solo Venom movie after seeing the latest trailer. And what's this about an expanded backstory/mythology for symbiotic race? Call in LIVE at 646-915-9620.